The New York Yankees captured their fourth straight American League pennant with ease, winning 106 games despite the loss of Lou Gehrig, who was diagnosed with amyotrophic lateral sclerosis. The Cincinnati Reds withstood a late charge from St. Louis to win their first NL flag since 1919. Red Ruffing, who had a three-game winning streak in World Series comeptition, ran his streak to four with a victory in Game 1, beating the Reds, 2-1, in Yankee Stadium. When the Yankees came to bat in the ninth, the score was 1-1, as Cincinnati starter Paul Derringer had matched Ruffing by allowing just four hits. After Red Rolfe led off with a groundout, Charlie "King Kong" Keller tripled to the right-field bleachers. 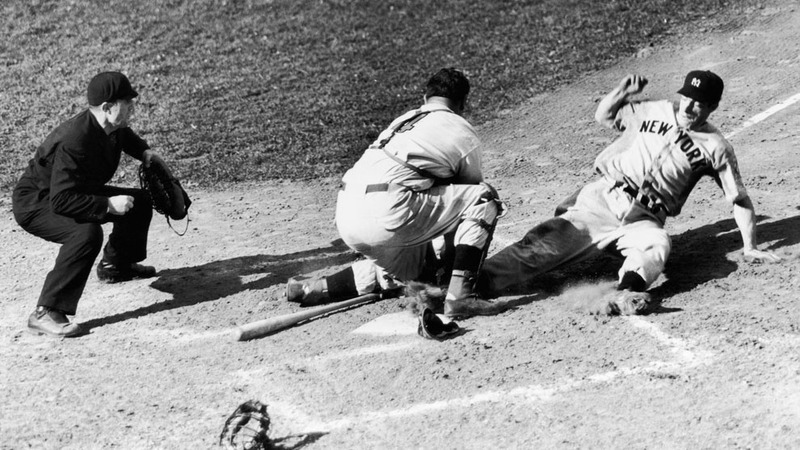 Joe DiMaggio was intentionally walked, but the strategy proved fruitless when Bill Dickey followed with a single to center field, scoring Keller with the winning run. In Game 2, Yankees right-hander Monte Pearson posted one of the all-time great World Series starts. After seven innings, Pearson owned a 4-0 lead and was working on a no-hitter. Ernie Lombardi broke up the no-hit bid with a clean single in the eighth, and Billy Werber collected a base hit in the ninth, but Pearson finished with a two-hit, one-walk shutout, striking out eight. Two days later, the World Series resumed in Cincinnati, and the Reds grabbed a 3-2 lead in the second inning on the strength of four singles. After that, it was all Yankees. In the third, DiMaggio blasted a two-run homer over the center-field fence, and in the fifth the Yankees scored three times on Keller's two-run homer, his second of the game, and Bill Dickey's solo shot. Bump Hadley, who relieved New York ace Lefty Gomez in the second inning, pitched the final eight frames to earn the 7-3 decision. Needing a win in Game 4 to avoid elimination, the Reds carried a 4-2 lead into the ninth inning. Keller and DiMaggio opened the ninth with singles, but Dickey hit a perfect double-play ball to Reds second baseman Lonny Frey, who relayed to shortstop Billy Myers ... who dropped the ball, allowing Keller to score. DiMaggio later scored to tie the game, and the game went to extra innings. And with the help of three more Cincinnati errors, the Yanks scored three more in the 10th. Cincinnati didn't score in the bottom of the inning despite a pair of singles, and the Yankees had a 7-4 victory and their fourth World Series in as many years.